Did you know that average person spends 1.5 years in the bathroom and 92 days on the toilet during their life? That’s a lot of time! Also, there is nothing better than warm relaxing shower after long day at work. You bathroom should be place to enjoy and relax. How is your bathroom? If it’s cold and outdated then it’s time to do something about it. Make it your own and inviting. Make it room where you want to spend time. I usually advice against partial remodeling. 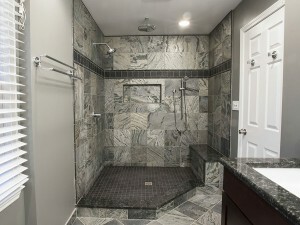 In my opinion much better option is to wait until you can do full bathroom remodeling. It’s more cost effective at the end and less headache. Why would you replace pluming fixtures and leave old vanity? It will suddenly look even more outdated. “Ok, so I will replace the vanity with top now. Oh.. I need to remove the faucet that was just installed? Done! But the tile looks really ugly now against new vanity. Hmm.. New vanity is sitting on top it.” You know where I am going with that. It might look like good idea to do updates here and there but unfortunately it is not. Take my word for it. Full bathroom remodeling is way to go. You can do simple bathroom remodeling where you replace all components in the bathroom. 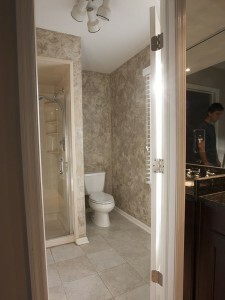 Other option is to do custom bathroom remodeling where you enhance features or expand the bathroom. Depending on the current house layout you might be able to enlarge you existing bathroom to finally have that large shower you were always dreaming about. Custom shower that replaced the old one. Just look what could do just by moving bathroom wall 2 feet into walk-in closet. In this case customer has always wanted large shower so we have decided to enlarge the bathroom and build custom shower base. I think it has turned out beautifully. It was major change to go from 3’x3′ shower to this custom shower with shower seat, handheld shower conveniently placed near shower seat, rain shower head, regular shower and ceiling light. So much more fun to use this new roomy shower, wouldn’t you say? Click here to see detailed step by step description of this project with pictures. So what should you expect to be done when doing bathroom remodeling? Here are some steps that will most likely be included. Remove everything – vanity, toilet, bathtub or shower base. Remove floor and wall tile with tile underlayment. Remove drywall as needed. Noisy exhaust fan? Good time to replace it or upgrade to something better now. Remove all accessories such as tile racks, toilet paper holder etc. Remove shower/tub valve, move drain if needed. Getting wider bathtub? Yes, you’ll need to move drain. Move electrical if needed for that new exhaust fan. You might also need to change duct work for new fan. Now it’s time install new shower pan or bathtub. Install new tile underlayment and new drywall. Tape and patch all as needed. Install new tile, vanity, vanity top and fixtures. Don’t forget the shower door! Install all accessories and you are done! Move plumbing to new location. For example you will move vanity to different spot or you decide to have wall mounted faucets. All steps above can create beautiful bathroom you will enjoy for years or nightmare that will keep you worrying every time you enter the bathroom. You need to understand that there are a lot of elements that can cause problems when installed incorrectly or with poor workmanship. Some of that might show up in few weeks in form of tile cracks and some might be discovered years later in form of growing mold inside of the wall due to tiny leak. Some of them might be dangerous and life threatening. It takes time, knowledge, craftsmanship and quality materials to get best results. We are here to offer you all that at it’s best. Contact us today if you have any question or call Charles at 1-815-200-8558 for free bathroom remodeling estimate near Conifer, Co or Evergreen, CO.